Could Class 165 HyDrive Trains Be The Solution To The Greenford Branch? I ask this question, as I think the Greenford Branch should be developed and run at a frequency of four trains per hour (tph). I give my reasons in An Illustration Of Why The Greenford Branch Needs Four Trains Per Hour. I described the proposed Class 165 HyDrive trains in Class 165 Trains To Go Hybrid. These are given as the advantages of these and other hybrid trains. Smooth and powerful regenerative braking. Less gaseous and noise emissions. A two-car Class 165 train can already run on the branch, so I’m pretty sure, that to run on the route,, a Class 165 HyDrive train would require no new major infrastructure, like lengthened platforms or electrification. The Greenford Branch is double-track. 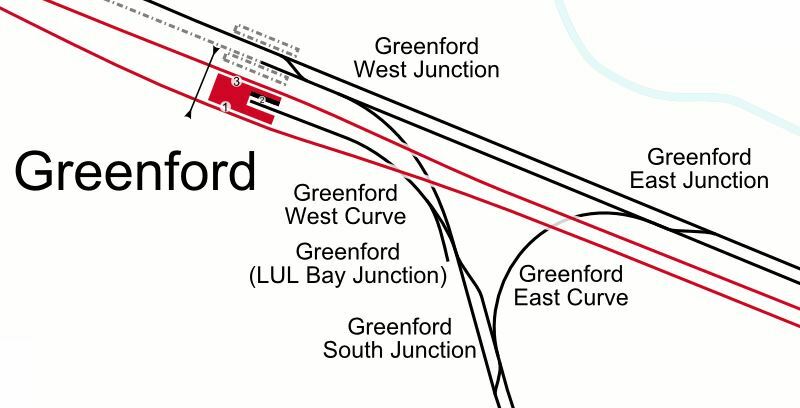 This map from carto.metro.free.fr shows the track layout at Greenford station. Note that both tracks of the branch, are connected to the following. The bay platform in Greenford station, where the service on the branch terninates. Both tracks of the Acton-Northolt Line going West using Greenford West Junction. Both tracks of the Acton-Northolt Line going East using Greenford East Junction. It is a well-designed junction, where all required movements seem possible. This map from carto.metro.free.fr shows the track layout at West Ealing station. Unlike at Greenford station, it appears that, there is no connection from the bay platform at West Ealing station to the left track towards Greenford station. This might make it difficult to run the more frequent service of four tph, that this line needs. So there might be a need for an extra crossover or minor track updates. The current service is two tph, which is based on a single train, shuttling backwards and forwards. Obviously, the train can only do two round trips in an hour. The proposed Class 165 HyDrive train will not offer and dramatic improvements, but its superior acceleration and braking, could speed up the three intermediate stops by a minute or two. But I doubt that this would be enough time savings to enable one train to achieve the much-needed four tph. This could be achieved by two trains. Train 1 would run as follows. Train 2 would run as follows. Note how Train 2 is fifteen minutes behind Train 1. With the track improvements at West Ealing station, two Class 165 trains could run this timetable, if they were well driven and nothing went wrong. But I believe that if the more agile Class 165 HyDrive trains were to be used, they could use their performance to regain the timetable. Their extra performance might also allow the creation of some extra paths for freight trains and empty stock movements.